Guaranteed best priced aluminum gutter guard backed by the industry’s strongest written warranty. Since my father invented LeavesOut in 1989 it has proven to work in all conditions and on all homes. LeavesOut is Customer Rated #1 Web Wide and offers the industry's strongest written transferable lifetime warranty. Learn more on our features page. The LeavesOut Gutter Cover blends in perfectly with homes. The gutter cover has a super low profile and a protected "nose". It adds value to your home. Protects your home from expensive water damage. And comes with a transferable warranty. 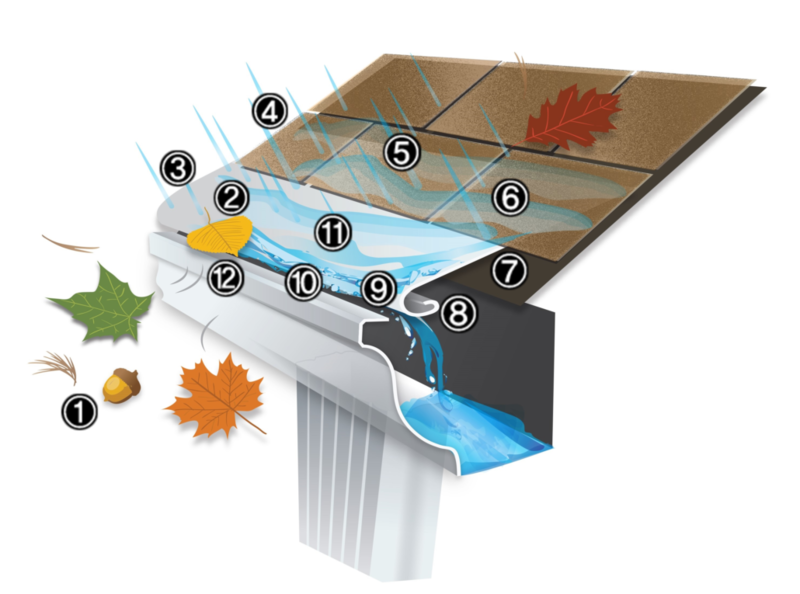 The LeavesOut gutter guard's features is why it is rated #1 web wide. 9. Patented 280-Degree Low Profile, Almost Disappears! I love my Leavesout gutter protection! Ben is an honest individual who guarantees his work. His experience and training have made him someone who does his best to help his customer. Integrity and compassion are part of his qualities, too. We built the gutter guard business we'd want to do business with. We hope you do too! #1 Rated Web Wide – Customers nationwide rave of the proven benefits of the LeavesOut Gutter Guard! Since 1989 LeavesOut has protected tens of thousands of Homes! Strongest Written Warranty – Lifetime no-clog, lifetime Alcoa material, a money back guarantee proven to handle the hardest rains, with a free 20 year transferable warranty. Invented by my Dad – As a retired major from the Air Force he saw the need to have a proven product that actually kept working for generations to come! Roof and Gutter Repairs – We will do minor repairs to your gutters, roof and other areas at no cost. Additional areas of concern we refer you to a trusted professional. LeavesOut installed Gutter Guards on our home and it works perfectly. Ben also pressure washed our home and it looks like new as well! Very professional job. Thank you Ben! From Seamless Gutters to The Industry's Best Rain Protection System, We Have Your Gutter Solution! Our seamless gutters come with a 20 year warranty and are great for homeowners looking for gutter installation or replacement. The LeavesOut Gutter Guard is the industry's highest rated gutter cover web wide and backed by the industry's strongest written warranty. When you purchase gutters or gutter guards with LeavesOut of Raleigh, you get complete gutter cleaning at the time of installation. Thank you so much for installing the gutter guards and downspouts on my house. You were thorough and professional and worked so quietly I hardly knew you were here. You even went the extra mile and repaired some of the gutters that had come lose or were missing screws. I’ll be telling all my friends about Ben and LeavesOut! We proudly serve the greater Raleigh-Durham, NC area. Like our service? We'd love it if you'd share LeavesOut with your friends!